Cardiff Devils, pictured after their play-off success, lost to Coventry on the final day of the regular season to hand Belfast Giants the Elite League title while the Giants were celebrating at their annual club awards dinner. Cardiff Devils managing director Todd Kelman says their play-off title win means more after their Elite League title heartbreak on the last day of the regular season. 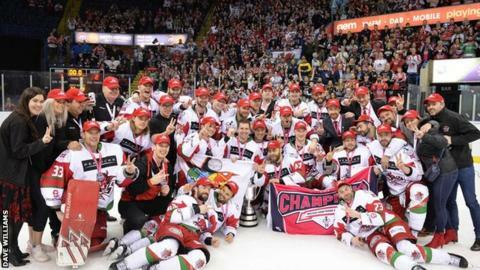 Cardiff Devils beat Belfast Giants 2-1 to lift the Elite League play-off title for a second successive year. Giants pipped Devils to the Elite League when Cardiff lost at Coventry. "This win means the most. Because we lost the league it means more," Kelman told BBC Sport Wales. "We felt going into the last weekend of the season we had the chance to win the league and I would say we messed that up." Kelman felt a final showdown between Belfast and Cardiff was an appropriate end to the campaign. "It is amazing. We said at the start of the weekend: 'this whole season came down to us and Belfast battling it out'. "We felt this team was too good not to win a championship, we needed something and our goaltender (Ben Bowns) needed his best game of the year. "It is tough to pick yourselves up after losing the league on the last game of the season, it really is." Devils coach Andrew Lord admitted his side were second best in the final, but paid tribute to GB goaltender Bowns who produced a man-of-the-match display. "I am so proud of the team. To come up short on the final day of the season and lose on a tie-breaker is gut-wrenching and not too many teams could come back from that and play like this," he said. "To see our goaltender play like he did, I am so proud of him. There has been a lot of adversity for the guys. "The way they put their bodies on the line is something else. I feel really fortunate to be part of it. "The Giants really made us work hard, they really outplayed us tonight I think. They had the majority of the chances and Bownsy played the best game I have ever seen him play. I think he had a point to prove and he proved it." Bowns added that successive play-off successes did not diminish the Devils' Elite League disappointment. "I knew I had to be big for the guys in goal," Bowns told BBC Sport Wales. "It doesn't make up for not winning the league, but it is definitely nice to win this one."